Comics are a unique form of art and communication. They convey different registers of experience where thoughts (as bubbles), speech (balloons), actions and agency ("motion lines"), things happening on a somatic "gut level" (stomach butterflies representing anxiety) can be represented in a single frame. They allow readers the freedom to take their time with a single element or let their eyes drift from panel to panel. We chose this medium for our latest campaign to de-stigmatize psychosis and psychosis treatment because we felt comics would be helpful in giving different perspectives. 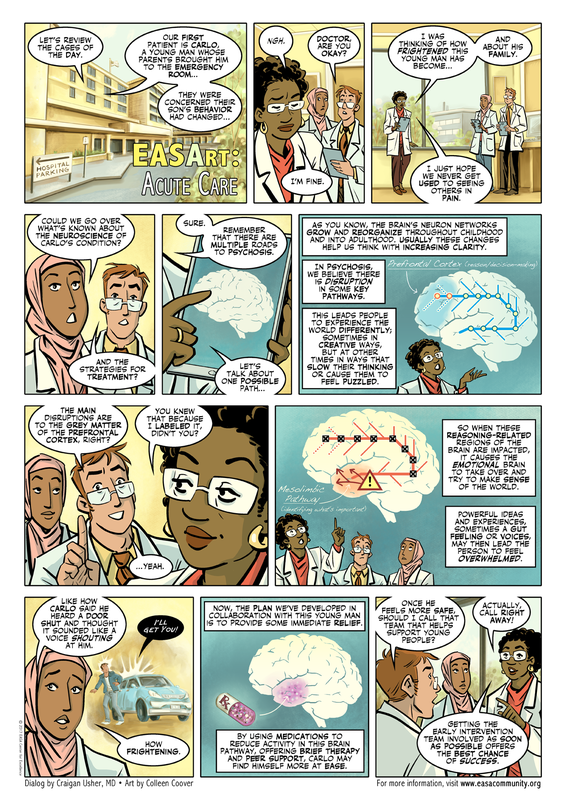 In this first trio of comics, we get a “behind the scenes” look at a physician workroom in a teaching hospital, eavesdrop on a coffee shop conversation between two mothers, and attend an EASA Workshop where our protagonist, Carlo discusses his lived experience. This three comic project is meant to provide education and promote empathy. After reviewing these with the Young Adult Leadership Council, we are releasing them to the public and encouraging you to put them up in your office space and share them with individuals and families. We hope that this is the first of many cartooning projects to come and would love to see more and more comics written by those with lived experience. Please stay tuned for opportunities to join us for EASA cartooning classes, art shows, and more EASArt installments. Ryan Melton, Tamara Sale, Katie Hayden-Lewis, and Craigan Usher worked on this project alongside Portland-based artist, Colleen Coover. "Acute Care" is about the neuroscience of psychosis. Keep in mind, everyone's experience is unique and this simply represents one possible path. "A Mother's Love" is about the importance of staying connected to supportive others through any stressful stretches of life, but particularly as families and individuals face difficult mental health challenges. 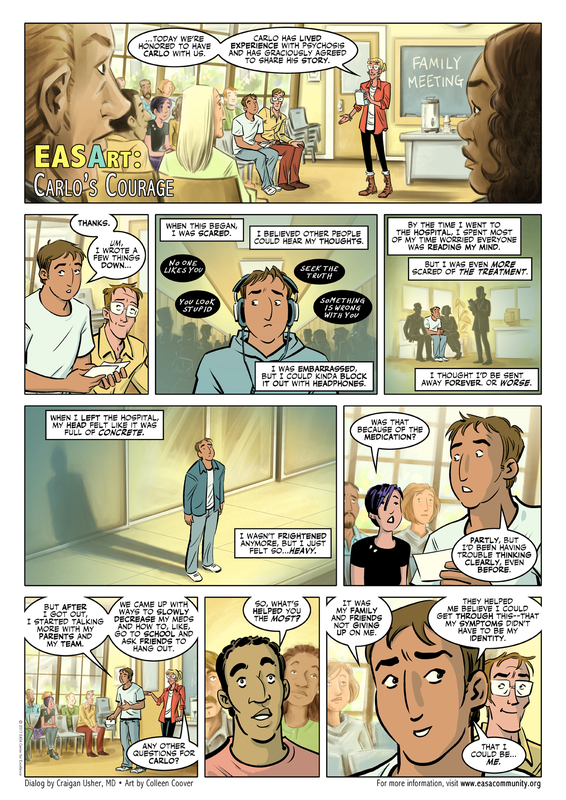 "Carlo's Courage" depicts the main character reflecting on his experience in an EASA Workshop. 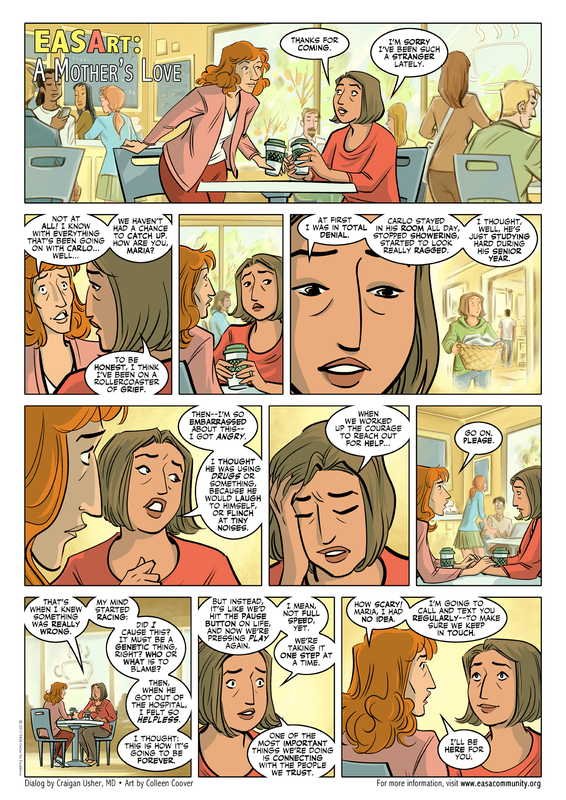 The emphasis in these few panels is on hope--that individuals may find themselves able to get through difficult times and, drawing from these experiences, be able to reflect in their success and help others too. Readers are urged to notice how Carlo finds comfort that a diagnosis or participating EASA program did not consume his life or replace his identity.